"Egypt on the eve of the 1973 October war. A young man has been drafted into the army. His father, the village elder, persuades a poor night-watchman to send his own son as a stand-in. But the impersonation plan goes horribly wrong, with trafi-comic results. Al-Qa'id's tale of the fiasco - steeped in black humour - parodies outrageous corruption and ludicrous bureaucracy. A skillfully-crafted mosaic of life in modern Egypt. 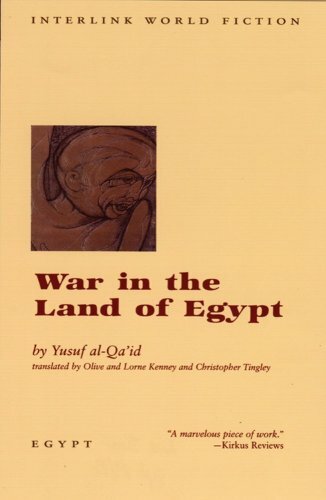 Yusuf al Qa'id is one of Egypt's outstanding writers with eleven novels and four short-story collections to his credit. Written in 1975 and banned in its country or origin, 'War in the land of Egypt' is the first of his novels to be translated into English." I'm going to take part in a Finnish alphabet challenge with this book. In the challenge you have to read one book per each letter in the Finnish alphabet, and the author's surname has to start with the letter in question. This should count for Q since the authorized version of the author's name is written Quʿayd, Muḥammad Yūsuf al-. I offered this as a ray on the Finnish forum but since Sumako was the only one interested, the ray is now cancelled and the book is going to Sumako. This was a surprisingly good book! It's about the divide between the rich and the poor, power and powerlesness, and justice and injustice. The main lines of the plot were quite predictable, but the book still managed to intrigue me. I haven't read much (any??) African literature before, so this was a pleasant surprise as I had no idea what to expect. What especially stands out is the narrative technique where the story is told from several different points of view, but none of the characters repeat what has already been said. A great way to shed light on different views while at the same time keeping the story going without repetition. I don't think I've ever seen narration quite like this before. Tietääkseni ensimmäinen egyptiläisen kirjoittama kirja hyllyssäni. Kiitos! I liked this book, and the way it was written. The different voices who where involved in the story each told their part. Whether it gives a true insight into the Egyptian way of life, I do not know. I also liked the fact that it was set in the countryside, most of the books I've read by Egyptian authors are all set in Cairo. This book was offered as a RABCK at the one-RABCK a month thread, however, as so many people wanted the book I will make it a ray in order for more people to enjoy it. Please read the book within a reasonable time - no need to hurry, as I do believe all of the participants have other books to read whilst waiting for this one! Thank you very much for this ray book, looking forward to reading it. It's 1973 and Egypt is at war with Israel. When a wealthy village leader's son is drafted into the army, he's already used every excuse in the book to get his other sons out of service so he has to go for something more extreme - persuading a poor night-watchman's son to take his place. There's some dark humour in the unfolding events as the different characters tell their parts of the story, but the sheer level of corruption and inequality is shocking. Received with thanks! Will start after my current read. This was an ok read, well written and structured. Story itself is about corruption and powerlessness of the ordinary man. Nothing new there frankly. Sent to the next reader in the BR. The book arrived safely, along with an other ray, thank you. I'm going on a trip but I w'll read it asap. I'm a bit disappointed. I agree with Blue_berry though. On its way to Berlin... Enjoy ! The book arrived safely in Berlin today. Thank you very much for sending it over and for the pencil aswell! Will start to read asap. Interesting book. Really liked the different aspects of the story. The book is on its way to the next reader. Enjoy! This book is now in my hands. Thank you duskiska for registering and sedna5213 for sending it over and for your nice postcard and stickers! And thank you everyone for making this book's journey so interesting and for keeping it on the move! This is a quick read, written on a poignant, ironical, almost farse-ose style while touching on bitter truths through a rather predictable story. A bitter-sweet book featuring lots of symbolism and multiple layers, full of black humor and rather sad realisations about the way this world works. An easy novel due to writting style, but a hard one due to context. The book arrived in Canada. I will start reading soon and keep the ray going. Thanks for sending. Thank you for offering this as a ray so that we can all enjoy it. I really like the book, particularly the narrative set up. I agree with Delphi_Reader who says the writing makes it an easy read but the context makes it hard. Off to the next reader it goes. I didn’t realise that I only posted on the Bookring thread and hadn’t acutally journaled the book. Anyway, I have now finished and am sending on to Edwardstreet in NZ. Thank you for including me in this ray. I liked the book and how it was written. I kept waiting for the funny bit but realised in the end that it was black humour more than anything else. Off to the next reader in New Zealand. In the mail to the next recipient in the ray. This book is now with me. Thank you for sending it. Cool to receive such a well-traveled book!